See more objects with the tag interior, decoration, container, home, globular, stemmed, oxblood. See more objects with the color black dimgrey dimgrey or see all the colors for this object. This is a Vase. It is dated mid–late 18th century and we acquired it in 1927. Its medium is glazed porcelain. It is a part of the Product Design and Decorative Arts department. 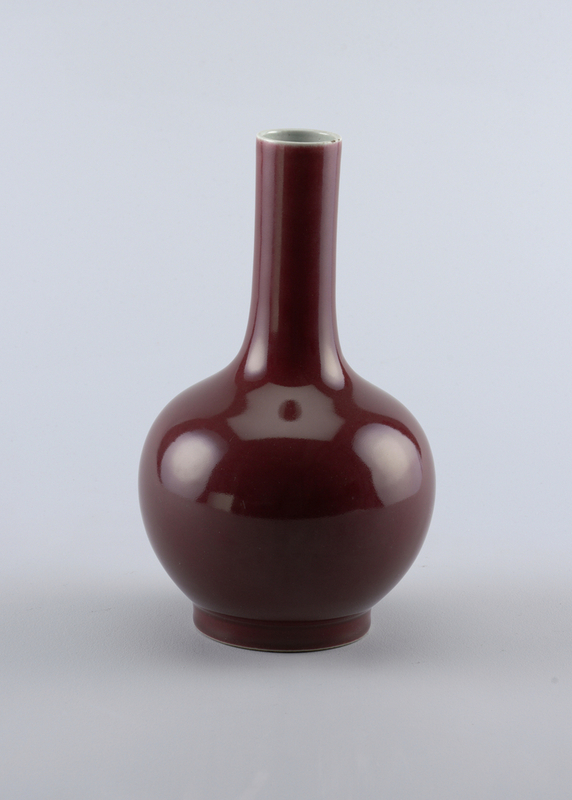 The deep red glaze on this porcelain vase is derived from copper, a metal which is notoriously difficult to control under the heat of a kiln. Oxblood, or Sang-de-boeuf, glazes are among the most distinctive and elusive of all high fire ceramics. Made during the Qing Dynasty (1644-1911), this vase embodies the continuation of centuries of Chinese ceramic traditions. The noble simplicity of the form, with its slender neck and short foot, references shapes established by potters of the Tang dynasty (618-906). Chinese red glazes were developed over several hundred years; some of the most celebrated examples date to the early fifteenth century, when potters of the Ming dynasty (1368–1644) produced wares for use in imperial rites. The technique for red glazes was lost in the sixteenth century but was revived approximately two hundred years later, when Jingdezhen potters were commissioned by the court in Beijing to develop replications of classical glazes. Oxblood glazes have been greatly admired by Western collectors. Many American and European potters of the eighteenth and nineteenth centuries pursued the challenge of recreating the coveted glaze in their own studios and factories. This object was featured in our Object of the Day series in a post titled Elusive Oxblood.